Afraid of Big Service Pack Updates? Afraid to install Windows XP SP3 "out of fear it will cause problems with my current settings," Nirvana asked the Answer Line forum for advice. Even I'm scared of major service pack updates. I tend to put them off as long as I can, at least on my main work computer. (I update my test PC immediately, but the whole point of a test PC is that I don't care how I mess up Windows.) But if you take the precautions below, updating Windows with a service pack will be less dangerous than not updating Windows with that service pack. First, don't rush. Wait a couple of months. That will give everyone a chance to get the kinks out--or at least publish reports on those kinks. Once you're in the know, update your drivers. You can go to DriverAgent for a list of your drivers and a report on what needs updating. 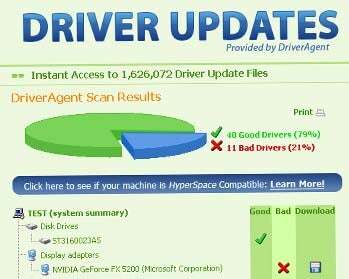 You'll have to pay $30 a year to download the drivers from DriverAgent, but you can use their free report and download the drivers from the various vendors' Web sites. When you think you're ready, scan your system for malware. Use the free version of either SUPERAntiSpyware or Malwarebytes' Anti-Malware. Better yet, use both of them. The update is supposed to create a restore point, but just in case, create one of your own. In Windows XP, select Start • All Programs • Accessories • System Tools • System Restore. Select Create a restore point, click Next, and follow the prompts. In Vista, select Start, right-click Computer, and select Properties. Click System protection. With your C: drive checked, click Create and follow the prompts. If you're really paranoid, make an image backup of your drive. Now you're ready. Go to Windows Update, grit your teeth, and make that update. My thanks to SpiritWind, whose answer to Nirvana's original post was the basis of mine. You can read it at http://forums.pcworld.com/message/202173.